The secret to glowing skin? 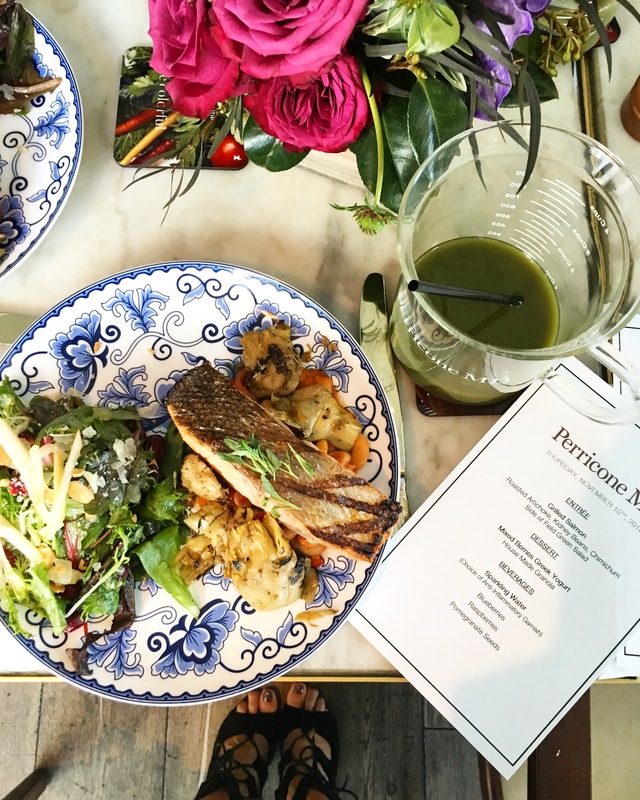 The skin-loving lunch at the press event for Perricone MD. 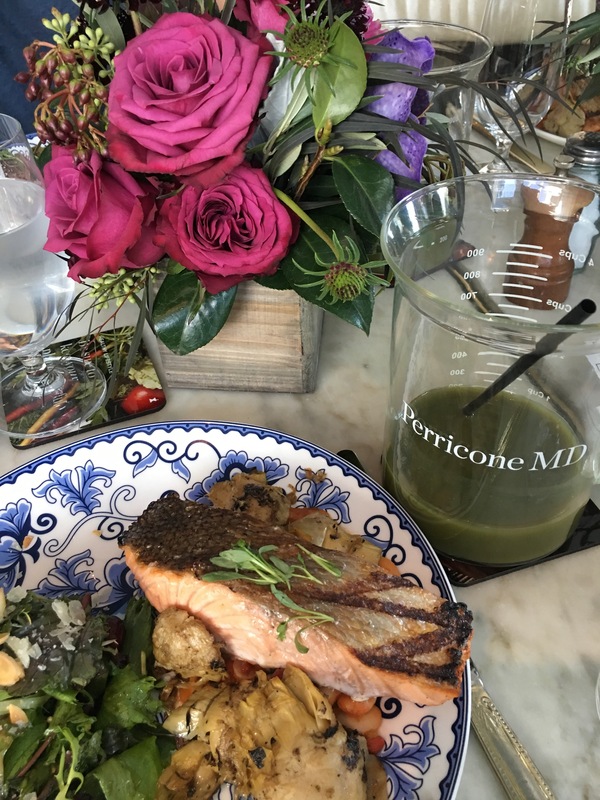 When I went to a luncheon for Perricone MD last month, hosted by Dr. Nicholas Perricone himself, I wasn’t sure what to expect. After all, I had tried some of their products over the years — and by tried, I mean I applied a few serums on my face a grand total of, like, three times each — and sort of gave up on them and moved on to other beauty samples needing my attention. It’s hard when you’re a beauty editor, and there are shelves and shelves full of product, calling out your name and promising to become your next holy grail item. The problem wasn’t Perricone MD’s efficacy. I mean, barring a hideous reaction, three tries of a product is hardly enough to know what it’s going to do for your skin. The problem really was — to paraphrase Marie Kondo — that they didn’t spark joy in me. I didn’t love the packaging, swoon over the texture, wonder at the glorious finish on my skin. Yes, the press materials were impressive in their science-driven argument that this serum/treatment/moisturizer would change my skin for good. But a lot of skin care brands make that claim. And I kept getting distracted by all the sparkle and gold and minimalist packaging of other, perhaps more marketing-savvy tubs and jars and bottles. 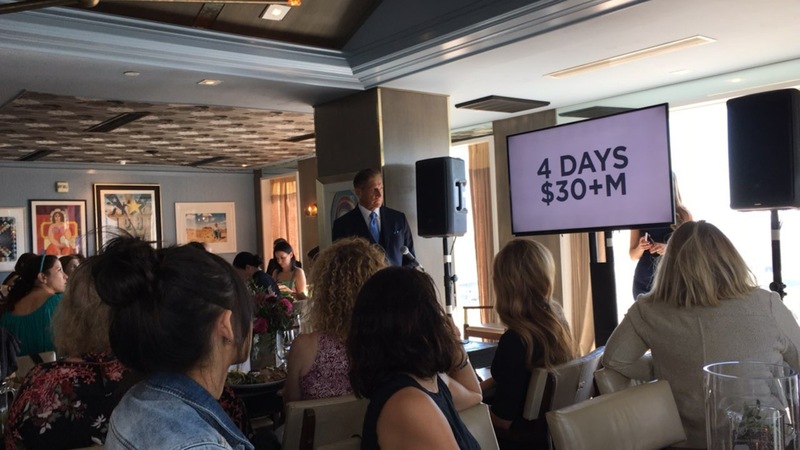 But Dr. Nicholas Perricone himself would be at this luncheon, and I knew Perricone MD was a legit, science-backed, substantive skin care line. So I wanted to learn more (and frankly, to be convinced), firsthand. After all, Perricone MD is the number 11 brand in prestige skin care, as well as the fastest growing brand in the top 15. Dr. Nicholas Perricone enlightening beauty editors at the Mondrian Hotel on Sunset. Well, consider me a convert. Dr. Perricone’s backstory is fascinating. As a resident, he realized that every time he looked at a disease process under a microscope, whether it was Alzheimer’s or heart disease or diabetes, there was inflammation. So he asked his professor at the time whether inflammation was the driving process in all these diverse diseases. “The answer was a roll of the eyes,” Dr. Perricone recalled. Then he went on to his pediatric residency, and while studying asthma, an inflammatory response condition, he did a study where he found that relatively high doses of vitamin C reduced asthma attacks by 50%. Armed with real clinical proof that antioxidants were anti-inflammatories, he continued his study of inflammation during his dermatology residency. (I know, talk about an overachiever, seriously.) He found that under a microscope, not only did diseased skin exhibit inflammation, so did clinically aging skin. Young skin didn’t exhibit inflammation, confirming his supposition that inflammation was the bad guy. But where did the inflammation come from? Sure, external causes included the sun, the environment. But what about the inflammation coming from inside the body? Dr. Perricone suspected that diet had an effect, so he started researching that. He found that when his patients cut out sugars from their diet, they looked better. Of course, back then, the medical field laughed at him. They didn’t believe that what you eat can affect your skin. Of course, today, we all know that diet is intimately tied to how our skin looks. I love the giant beaker. We got to take it home with us, along with our own skin care “prescription” of Perricone MD goodies. Review to come soon! A green salad with olive oil and lemon satisfied our phytochemical requirement, which Dr. Perricone was effusive about. Why are phytochemicals so powerful in reducing inflammation? “Because the levels you’re getting in the blood are not powerful enough to have a therapeutic effect,” says Dr. Perricone. The old way of thinking was just feed yourself antioxidants. But one molecule of antioxidants eats a free radical, and then they cancel each other out, so eventually your antioxidant pool is depleted even if you take a lot of it. The same thing when you go in the sun — you take vitamin c and coenzyme Q10, you get a benefit in the skin, but then after 45 minutes, your antioxidant levels are completely depleted. So in 1997, Perricone MD started with a stable form of vitamin C, alpha lipoic acid, and their signature firming ingredient DMAE, all of which had one thing in common: reduce inflammation in the skin so skin can repair itself. Today, Dr. Perricone has taken his love of phytochemicals to the next step by putting them in a new topical skincare line. To enhance penetration in the skin, he came up with a matrix that can carry large molecules into the skin. This resulted in his most recent discovery, a line of prevention-oriented products called Pre:Empt. Made for the 20- to 30-something, this line boosts antioxidant activity using phytochemicals to fight the first signs of aging. 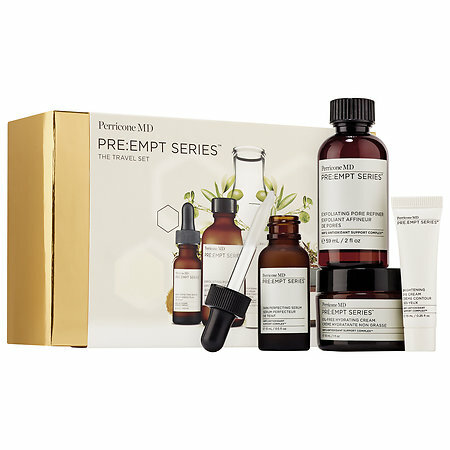 Pre:Empt may not be for me, as a 40-something, but trust me, I’m a lot more excited about other Perricone MD products than I ever have been. As I spoke to Chris, the brand’s chief innovation officer, I learned that Perricone MD may not have the prettiest packaging, but that’s because they spend their money on active ingredients, not expensive jars and marketing. (In truth, I’ve found that some of their treatments smell … well … less than great, and I guess that’s because they try not to use artificial fragrance in their products.) For them, it’s all about the ingredients, efficacy, and what really works. As soon as I got back from the luncheon, I pulled out the OVM Serum and Re:Firm Surface Recovery Treatment from the beauty closet, determined to give them another chance. Now if only I can get myself to exercise at all. I’m sure my skin would look uh-may-zing. Oh, thanks a lot! I will check the book as well. xoxo. Haha, my husband just tried the Re:Firm and fell in love. He says it’s perfect for guys because it melts into skin and feels like nothing on. I’ve always thought Perricone MD would be a good line for men, if only it weren’t so pricey. But I’m going to give it another try!